The right warm-up suit can bring your team together. You can’t just jump in the water and start swimming, assuming you will do well. You need to get your body warmed up and ready to go. Many swimmers do this by stretching and performing other exercises before practice or a race. After you warm up, though, you need to find a way to keep your muscles warm until it is your turn to enter the pool. Choosing a swim warm-up suit is the perfect way to keep your muscles warm. The newest in the line of Speedo warm-up suits is the Speedo Boom Force warm-up suit, which is available in men’s, women’s and youth sizes. These new warm-up suits are available in a wide array of colors to allow you to choose just the right combination to represent your team. The jackets and pants are fully lined to provide for the greatest warmth possible. The jacket is equipped with zippered pockets so you can store whatever you need with you without worrying about anything falling out of your pockets. Just because the Speedo Boom Force warm-up suits are the newest on the market doesn’t mean it is your only option. There are a wide variety of other warm-up suits for men, women and youth from the other big names in swim gear. Speedo makes additional warm-up suit options, providing swimmers with even more choices for colors and designs. Nike, TYR and Dolfin also offer team warm-up suits that will allow your team to remain warm after a warm-up before they enter the pool. 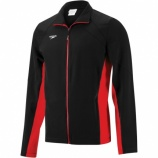 Available in a variety of colors and featuring the logo of the company for which the warm-ups are made. When you take the time to browse the vast selection, you will be able to find just the right suit for your needs. Warm-up suits are essential for anyone who is involved in competitive swimming. When you are working with a swim team, you can choose from the wide variety of colors, designs and companies so you can select a warm-up suit that is bound to please everyone on your team. When everyone is wearing their warm-up suit in your team colors, it will create a greater sense of unity for your team. Any way you can provide your team with that feeling of unity will only make you stronger.